For the first time since I moved into my present studio space …the walls are almost completely empty. Usually I have paintings hanging on the biggest wall and there are always others propped against it too. For a month now though I have the extra wall space as nearly all my work is out on exhibition. I’ve wanted to get down to doing some slightly larger pieces for a long time and as soon as all the work was away, I bought myself four biggish boards and started working on them ….well, three of them to date. 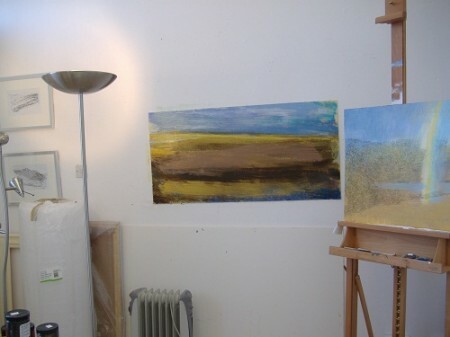 These boards are all 122 x 61 cm and so make for quite a good sized painting …certainly larger than I normally work on. For a long time now I’ve been rather tentatively using thicker paint. I bought a selection of colours from the Liquitex range of super heavy bodied acrylic paint. It’s wonderful thick sticky stuff but for a long time I didn’t know what to do with it! As I say, I was very tentative with my use of it at first but as time has gone by I’ve become somewhat bolder. So then, these new larger paintings are my attempt to take this process further, to try and work with more and thicker paint, bigger bolder marks and in a slightly more abstract fashion. As such I decided that seeing as I’m working on a different scale and in a slightly different way, I may as well paint a different subject too. New painting - "Harbour side"
My studio as you know by now is situated on the harbour side at Irvine. My front door and window look out across the road and quay to the River Irvine. On the opposite side of the river is a huge area of saltings that lie between the Irvine and Garnock rivers. The view from my studio window is constantly changing. On the high tides the saltings can disappear completely beneath the water, wee outcrops and an odd bush being the only land above water. 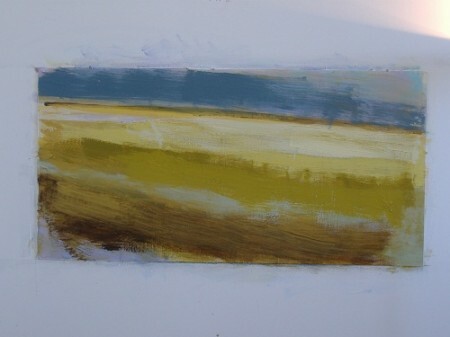 Then gradually the land begins to appear, first in long strips and then quite rapidly to leave just pools of water before on really low tides, there being no water to see at all from my studio. Add to this the constantly changing weather conditions and light …and great change in the colours due to the season and well, it’s quite an amazing place to work next to. New painting - "Irvine Harbour side"
The new paintings then are based on this very simple but at the same time complex (does that make sense?) view. I got thinking about this a few weeks ago when after a morning of heavy rain and dark brooding clouds, the conditions suddenly started to improve and small breaks appeared in the cloud allowing bursts of intensely bright light to fall through and onto areas of the saltings. The colours were amazing. The sky was a heavy dark purple grey blue and the far horizon a thin dark line. The saltings though were an intense bright mass of yellows and then back to ochre’s, olive greens and umbers in the shadow in the foreground. It was beautiful. I thought about photographing it but realised that it probably wouldn’t capture much of this and so instead just grabbed my small digital voice recorder (used to record meetings, lists of things to do and what to buy on my next visit to Asda) and simply tried to describe what I could see …a sort of audio sketch. The conditions, light and colours changed rapidly over the next hour and so I made four or five short recordings and decided to use these as the basis for my first couple of paintings. I’d never really thought about using the voice recorder as a kind of sketch book before and it has been pleasing how well it’s working for me. 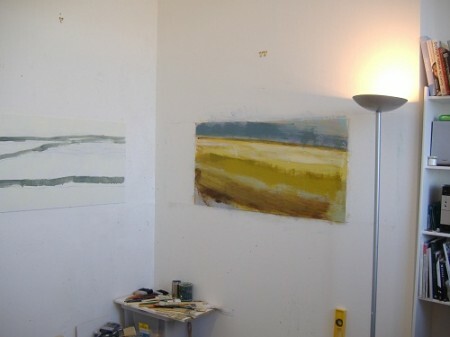 The first two paintings have developed quite well and I’m now starting on two others that are going to be about the view at or around high tide …and in different light….I’ve been making further recordings during the last few days while the high tides have coincided with the best daylight. I’ve tried to use just my bigger brushes …a one and a half inch flat brush being the smallest and then working right up to my large old six inch bristle house painting brushes. I have still drawn into these with pastel but this is quite limited and this just helps to create a nice balance of marks rather than being a main feature as in a lot of my previous paintings. It really has been an interesting couple of weeks and at long last this is much more what I’ve wanted to do. Of course having the funds to be able to purchase the materials (these paints are quite expensive …and a six inch house brush swallows a lot of paint) and being able to afford to spend time experimenting …is all down to the Jolomo Award. Without it I’d be forced to keep producing smaller more sellable paintings rather than trying to develop new and better and perhaps more challenging work. I was a lucky chap back in June 2009 when I won that award and its funding has supported me to this point and will probably do so for at least a couple of years more. The 2011 Jolomo Awards are in progress now and so it’ll be great to see who eventually wins through when the awards are announced in June. Who ever it is, they’ll certainly find it makes a huge difference to their career …it’s certainly made a huge change to my work as an artist. Anyway, I’ve got until the 12th March before the show ends at the Strathearn Gallery and my studio gets some what more cluttered again. That said, the gallery have sold a number of pieces to date so that has been very encouraging …and of course it means I’ll have to keep painting …I have a busy year ahead. 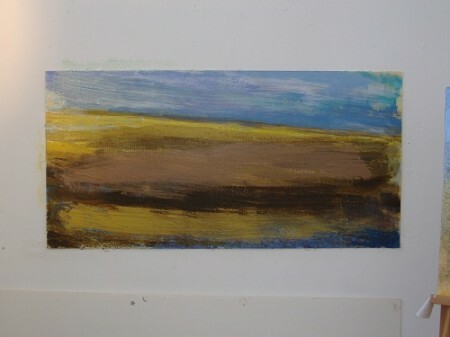 There should be a list on my website shortly, giving details of forthcoming exhibitions throughout 2011.